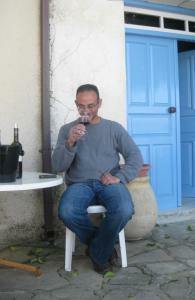 Winemaker Sophocles Vlassides of Vlassides Winery in Kilani. KILANI — Sophocles Vlassides warned us that finding his winemaking facility in this tiny mountain village wouldn’t be easy. There are no signs to direct us, and the steeply inclined streets seem barely wide enough to accommodate our rented Ford Focus. Then, we make a turn, and there he is. We recognize him from the photo on his website. A native Cypriot who returned to his homeland after earning an oenology degree at the University of California Davis in 1998, Vlassides, 38, is acknowledged to be in the vanguard of what quality-oriented, globally-aware professional winemaking goes on here. We’ve come to Kilani to get an idea of just how much progress is being made. There was a time when the wines of the eastern Mediterannean enjoyed high prestige and the sweet, high-alcohol wines of Cyprus fetched top prices, but that was centuries ago. Neither fashion nor fortune has been kind to the island since. Today, indigenous varietals like mavro, xynisteri, and maratheftiko are scarcely recognized beyond the country’s shoreline. But that is not to say that Cyprus ever went out of the wine business. Bulk wine producers remain busy, local wines appear on every household and restaurant table, and vineyard plots pepper south-facing hillsides in the Troodos Mountains — still the beating heart of Greek Cypriot winemaking. More significantly, one sees here and there signs of a quality surge that may yet put the island nation back in the consumer’s field of view. The improving impulse has several sources. Entry into the European Union in 2004 simultaneously imposed the community’s wine laws and made available several million euros worth of annual financing for vineyard restructuring. The first controlled appellation regime (think France’s AOC or Italy’s DOC system) was introduced here that same year, though it’s little more than a sketch at this point. But laws are not likely to be meaningful without a cadre of winemakers with the skill and determination to make their country’s wines competitive in a world market. Professional vineyard management and scrupulous hygiene in the cellar will make a real difference in base wine quality and represent the easiest gains, but Cypriots will still have to deal with the knotty problem of whether to stick with their indigenous varietals, shift to international vines, or find some workable combination of the two. Vlassides sees a turning point in 2005, when a few winemakers began shifting from purchased grapes to direct vineyard ownership or rental schemes that gave them complete control over vine management and grape quality. In addition to his 17 acres of estate vines, Vlassides farms 15 leased acres. Because many vines are newly planted and not yet productive, he supplements with purchased fruit. He sees this as a transitional strategy. Speaking in the courtyard of his tiny winery in the center of Kilani (the cellar is on the former site of his prosperous grandfather’s grocery store), Vlassides explains that he uses two indigenous varieties to make Domaine Vlassides wines, xynisteri and maratheftiko. He claims that no serious small-production quality-oriented winemaker in Greek Cyprus will use mavro any longer. “No color, no fruit, astringent, useless,’’ he calls it, though he admits that in the Commandaria region, it is still successfully blended with xynisteri to make a modern version of the island’s famous dessert wine. Vlassides says the debate over which indigenous variety Cyprus should bet its red wine future on is over. He believes winemakers will have to work with the maratheftiko variety, even though its quirks make it a bit of a problem child. Careful genetic selection may address some of its shortcomings, but Vlassides has concerns about this approach. “Do we really want to solve the problem if it means we lose [other aspects of] varietal character?’’ The winemaker doesn’t see a movement away from xynisteri for white wine, and notes that, when handled right, it has the ability to reflect terroir to a greater degree than previously thought. The next frontier, he says, will be experimentation with those international varieties that may find a unique expression in Cyprus, though determining this will take years. His shiraz and cabernet-merlot-shiraz blends are thoughtful and appealing. Each gets extended time in French oak barrels. Though distinctly modern in style, they seem drier and possess somewhat lower acidity than one expects. Toward the other end of the Cyprus wine spectrum are a number of larger, flashier properties such as the Kolios Winery in Agios Fotios. Its strikingly handsome building is set at the edge of a major roadway and can’t be missed. The expansive tasting room has spectacular views of tidy vineyards set amid rolling terrain and provides every tourist amenity. There’s a mix of indigenous and international varietals on offer here, too, but the quality seems to exist only to support a blander, more commercial, style of wine. It’s a phenomenon we found pervasive. For the convenience of travelers, the Cyprus Tourism Organization (www.visitcyprus.com) has established six wine routes, all concentrated toward the southeast quarter of the island. Krasochoria and Pitsilia may hold the most interest for tourists eager for a take on the developing winemaking scene here. But visitors shouldn’t turn up their noses at less trendy Cypriot wine experiences, like the glass of homemade xynisteri we enjoyed at a roadside restaurant in a mountain village: a little cloudy, a little fizzy, a little oxidized and, served alongside a plate of braised village rabbit, totally memorable. Stephen Meuse writes about wine for the Globe. He can be reached at onwine@comcast.net.